Maurice Rajsfus was a 14-year-old Jewish-French national living in the garrison town of Vincennes in 1942 when his family was rounded up by French police as part of the purge of Jewish immigrants in Vichy France. His parents were fated to perish in the Nazi concentration camps, but because Rajsfus and his sister were born in France, they were released and somehow survived in the war torn country. Rajsfus went on to became a prolific investigative journalist for Le Monde and has since has written numerous books about French collaboration with the Nazis, the atrocities of the Holocaust, and the current rise of anti-Semitism and xenophobia in Europe. Newly translated English editions of Operation Yellow Star and Black Thursday: The Round-up of July 16, 1942 have just been released in a single volume to mark the 75th anniversary year of the purge of Jews in France during WWII. 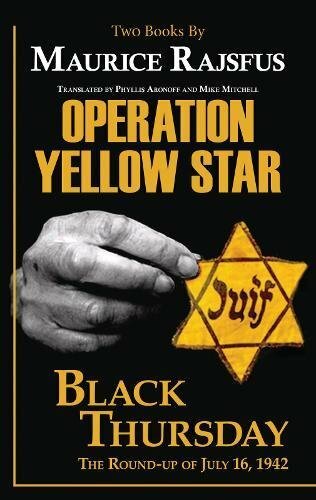 Operation Yellow Star is his meticulous investigative account of the Vichy government collaboration with the Nazis that forced French Jews to wear the yellow star on their clothing, thus branding them as a criminalized class who were summarily being barred from employment, vilified in the press, and branded as targets for harassment and arrest. Black Thursday is Rajsfus’s eyewitness account of the day his family was arrested in their home in the Paris suburb of Vincennes. Rajsfus’ parents were Polish immigrants who had lived in France since the 1920s. Although they were denied French citizenship, their children were considered Polish-French citizens. Maurice Rajsfus was 14 when his family was given five minutes to vacate their apartment. They were taken to a holding center, a palatial town house formerly owned by a rich Jewish family who fled the country the year before. A French prefect appeared midday and suddenly announced that any children 14 or older who were born in France could be at least for the moment released. Rajsfus’ mother gave her children all the money she had hidden and forced them to leave so they could save themselves. After that devastating day, they never saw their parents again. Since WWII, Rajsfus has followed every possible lead and document to corroborate and verify what he witnessed that day to provide more substantiated evidence of what happened in Paris under the Vichy government. Most of the official records had been destroyed or vaulted in an attempt to exonerate the French police and obscure their participation in the round-ups. As French police and officials saw the end of the war they wanted to be counted among the French resistance. Many of those same officials willingly carried out the pogroms in Paris, but when the Nazis were finally being defeated by the Allies, they quickly became part of the French resistance. They were later held up as heroes of the French resistance, their part in administering the Vichy government round-ups all but officially erased. Through his sobering, exhaustive research Rajsfus chronicles the arrests, harassment, and deportations of French Jews. A third book The Vél d’Hiv Raid: The French Police at the Service of the Gestapo, which chronicles the detention and deportation of 13,000 Parisian Jews and immigrants in 1942 will be out later this year. Rajsfus’ eyewitness, unblinking account of the events in Vichy France is journalistic, yet a passionately written j’accuse against the French collaborators and those who want to erase the devastating atrocities he witnessed.